Real business cycle models state that macroeconomic fluctuations in the economy can be largely explained by technological shocks and changes in productivity. These changes in technological growth affect the decisions of firms on investment and workers (labour supply). Hence changes in output can be traced to microeconomic and supply-side factors. Real business cycle models either completely reject or play down the role of aggregate demand in influencing the economic cycle. Real business cycle models suggest that government intervention to influence demand in the economy is generally counterproductive and the optimal policy is to concentrate on supply-side reforms which help the economy to be more efficient and flexible. Real business cycle models reject the Keynesian approach to the macroeconomy and also reject monetarism. It tends to be associated with neo-classical economics and the Chicago School of economics. An argument of the real business cycle is that if we ignore short-term fluctuations, then economies tend to show a long-run trend rate of economic growth which is fairly constant. Within a period, there will always be short-term fluctuations, but this can be misleading to the overall picture. If there is a downturn, the economy will tend to naturally correct itself and return to the trend rate of economic growth. The macro economy stems from individual microeconomic decisions. In particular, how do individuals respond to a changing environment and technology in deciding what to produce and how much to work? Thus according to real business cycle, economies have a strong basis in microeconomic principles. Real business cycle models assume individuals are rational agents seeking to maximise their utility. A basis for real business cycle theory is a simple neo-classical model of capital accumulation where individuals seek to invest in capital, and the price of labour will be determined by market forces. Thus under a broad set of conditions, work effort, investment and output will converge to a steady rate. Suppose, a new technology temporarily boosts productivity – how might these rational agents act? WIth higher productivity, there is a higher rate of return to investment. So this causes higher investment, higher output and higher wages. WIth higher wages, workers supply more labour. Therefore, this productivity ‘boost’ can cause an economic boom. However, if there is a dip in productivity, e.g. time lost to strikes or decline in productivity gains, then the opposite can happen. Firms cut back on investment; workers cut back on labour supply. This supply-side shock will also affect demand. With lower productivity, wages tend to be lower causing lower spending and therefore cause a fall in output and temporary recession. A technological shock can cause resources to move from one sector to another. But, it can take time for labour to move between different jobs. Therefore, there can be temporary structural unemployment. Another cause of unemployment in a real business cycle is due to the consequences of agents changing their decision to supply labour. Under some circumstances of technological change/change in trade unions power – workers may choose voluntary unemployment rather than supplying labour. 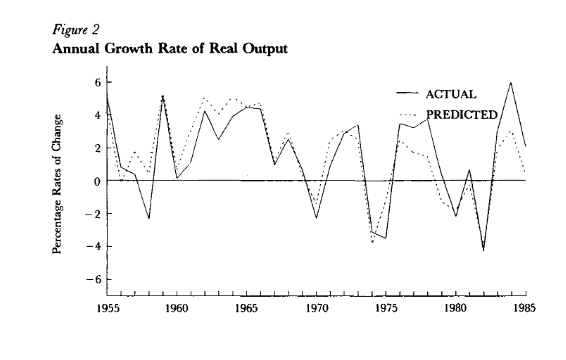 Real business cycles generally assume that shocks to productivity lead to fluctuations in the economy that are Pareto optimal. In others words, a temporary fall in output is an inevitable consequence of fall in productivity and not a cause for concern. The fall in output is a way for the economy to adjust to this new equilibrium and enable resources to find more productive uses. This is similar to Joseph Schumpeter’s work on “Creative Destruction” – the idea that failure of inefficient business is important for enabling productivity gains and economic growth. In the 1970s, there appeared a breakdown in the ‘Keynesian consensus’ with the oil price shock of 1974 causing a global downturn. This is suggested as an example of an economic downturn caused by an external shock. Real business cycle appears more believable, if we use data from the 1950s and 1960s, where economic growth was more stable. 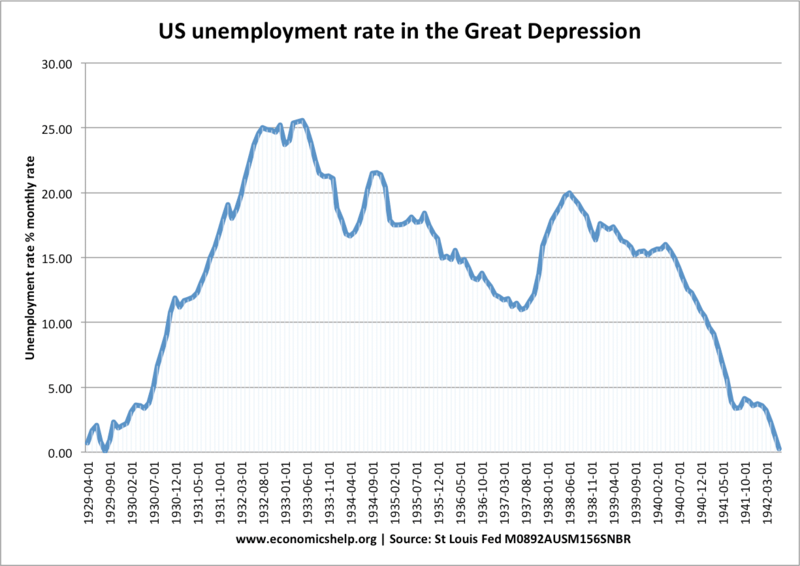 However, if we look at the Great Depression (1929-34) and the Great Recession (2008-12), the length and extent of the recession cannot be explained by supply-side shocks. 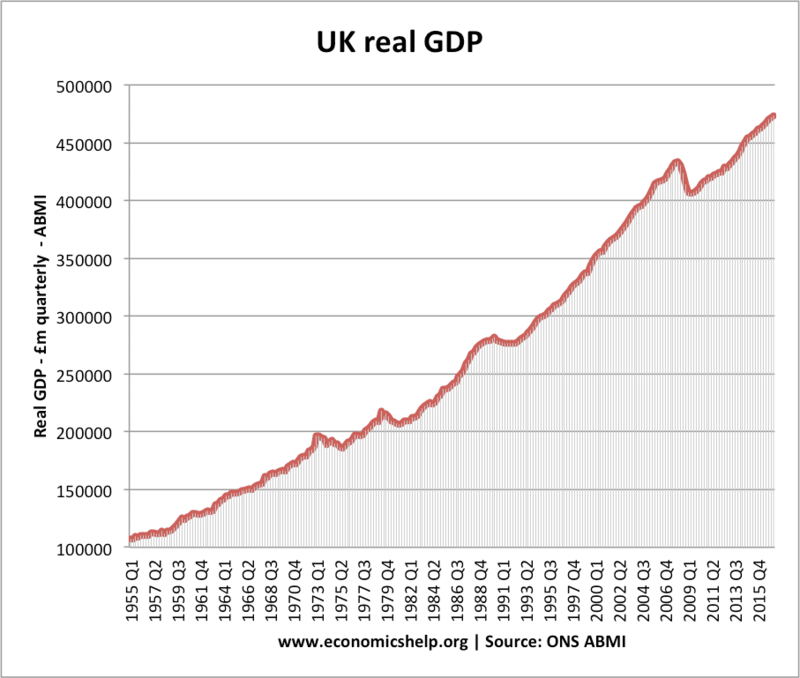 There is a clear impact on aggregate demand from a fall in confidence, a fall in money supply, a lack of bank lending. All demand-side factors that have a direct influence on the economy. Sustained unemployment Did unemployment rise to 25% in 1931 because of changes in labour preference and technological shocks? – This is very difficult for Real Business cycle theories to explain. Liquidity traps Real business cycle argues higher government spending can cause crowding out and be ineffective. However, in a liquidity trap, there is surplus saving and governments can increase borrowing, spending without causing any crowding out. Wage rigidity Real business cycle theories assume flexible markets and output is always at its real output. However, this ignores the role price and wage rigidity. Even neo-classical economists argue that monetary policy can play a role in dealing with labour market imperfections such as nominal wage rigidity. A clear link between interest rates and recession. If we look at the US recession of 1981-82, we can see a clear link between higher interest rates and a sharp fall in demand. 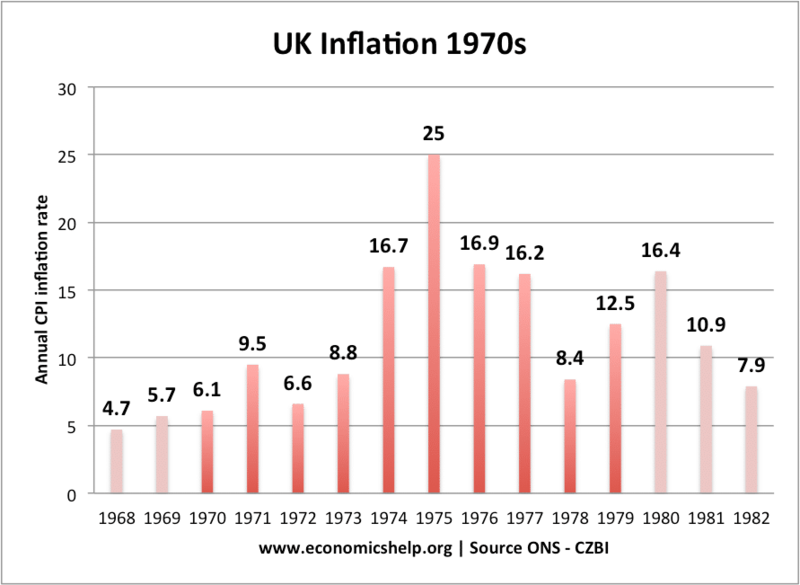 In the UK, in 1991-92, there was a clear link with interest rates rising to 15%. The sharp fall in demand and output has a clear link with a demand-side factor. Long-term nature of technological change. Technology takes time to diffuse into the economy. There wasn’t a big bang moment for the use of the internet; it steadily increased its scope in the global economy. 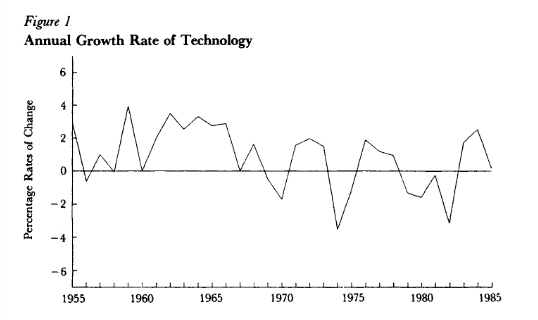 Technological change may be influenced by the economic cycle. In a recession, firms will cut back on investment and this will lead to a lower technological process. Therefore, rather than changes in technology causing the business cycle, it could be the other way around. How long do economic cycles last?